Bill Murray is one of the most recognizable American faces from both the small and big screens. Having made in mark on television with sarcastic wit on Saturday Night Live, becoming a puckish showstopper alongside the likes of Harold Ramis, and through his more recent work, it is clear that Murray has made a large impression on audiences – but that impression he made on viewers was minor compared to his antics in his personal life. Through a collection of stories, Gavin Edwards traveled across the United States in search of Bill Murray’s impression on the people whose lives he’d traipsed into at one point or another over the last four decades. From small antics, like daring a child to ride his bike into a swimming pool for five dollars to talking the JV women’s basketball team at Harvard to face him in a game of basketball, The Tao of Bill Murray is filled with random encounters with Bill Murray from the strangers who themselves couldn’t believe their unexpected encounters. 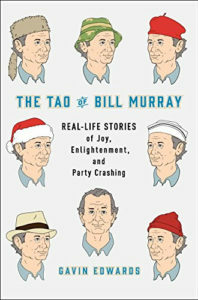 And while these stories are set up to delight fans of Bill Murray and those unaware of his atypical approach to life, The Tao of Bill Murray analyzes the apparent freedom of his life through a philosophical lens that makes sense of his behavior by challenging the reader to never accept the mundane as the norm. Gavin Edwards explores the fascination of surprise that comes with the way Bill Murray leads his life, as well as how fans may both come to better understand him and find some renewed joy in the way they choose to live their own lives. The Tao of Bill Murray was released on September 20, 2016 – order your copy today.